you safe from cyber attack. Satcom Direct (SD), a leading business aviation solutions provider, is hosting an ethical hacker giving live demonstrations of common and novel hacking techniques and cyber-attacks at the SD booth during MEBAA 2018, a key business aviation event ongoing in Dubai, UAE. The revealing presentations explain the potential impact of malicious intent, and how data network vulnerabilities are easily and simply exploited using systems readily and freely available on the web. Using real-world scenarios, Taylor Banks, who works for professional security testing firm CogniSec Inc. is highlighting how simple phishing, identity theft, cloning or wireless attacks can be countered with practical solutions. The examples highlight how Satcom Direct's threat monitoring, risk assessment and mitigation solutions address cyber-risk and reinforces the reality, and subsequent potential chaos, of operating without adequate end-to-end cybersecurity protection. 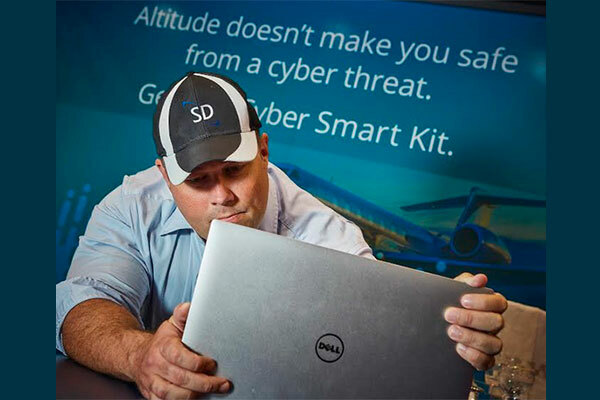 Alongside the hacking demonstrations, SD is showcasing its suite of SD Cyber Security Solutions portfolio, which combines the benefits of SD’s hardware routers, software services, ground infrastructure and technical expertise to protect business aviation data. The portfolio also includes the SD Threat Monitoring Module, a feature supported by digital flight operations dashboard SD Pro. The proprietary software provides customers with current and previous views of network security, highlights potential threats, and identifies incidents. With SD’s secure network infrastructure, SD customers also benefit from full data encryption from the air to the ground, while SD’s certified cyber security experts actively monitor data traffic to evaluate any risk. The SD Avionics family of routers, added to SD connectivity and SD Pro software solutions, provides detailed connectivity information, aircraft performance details, and cyber security data giving the customer real time flight management feedback to better support network and operational planning. When combined with the SD Private Network, the full suite enables IT departments to apply full corporate compliance protocols to their fleets, just as they would in their offices. Customers using the combination of SD hardware, SD software and the SD Private Network benefit from the SD guarantee of network security. “Aircraft have become digital platforms for incoming and outgoing data transfer, and we want to provide our customers with the most innovative solutions to protect vital information. Each system will have its own vulnerability, so the need to constantly monitor, and proactively prevent cyber-attacks is now imperative,” said Michael Skou Christensen, VP SD International. SD is also introducing delegates to CyberSAFE, (Securing Assets For End-users) the industry’s first certified training course which teaches aviation professionals how to avoid cyber security failures. Delivered in partnership with Logical Operations, the course educates users about technology related risks, compliance considerations, social engineering, and other data-security-related concepts.